Stadium like a yacht – this was the idea behind Dan Meis’s concept presented in May by the Citizens Stadium Advisory Group. However, the city commissioned the design work to a different firm, Populous, who are much more experienced in NFL stadium designs. Will this be a more viable option? It all hangs on whether the Chargers return to the negotiating table and agree to financial terms by early September. The city offers a specific model of financing and operating, much preferable to the Chargers supposed relocation stadium in Carson, Los Angeles. New vision for their NFL stadium in Mission Valley (replacing the dated Qualcomm Stadium) may surely be tempting. It was drawn to hold 68,000 people on regular matchdays with capability to increase by further 4,000 for large events, like the Super Bowl. As for theming, the stadium celebrates San Diego as “the city of villages”, thus it’s a series of semi-open, interconnected facilities rather than one opaque building. It’s gently covered from the outside with ribbon-like cladding that resembles ocean waves meeting the city shore. 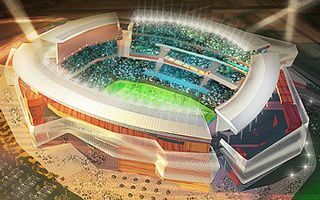 The new San Diego multipurpose sports stadium would be capable of hosting professional and amateur sports, entertainment, cultural, and commercial events at a modern and vibrant sports and entertainment center for the benefit of the San Diego region. The announcements in San Diego came as City-County negotiators and staff met with an NFL owners committee in Chicago to update them on the environmental report, stadium design and financing concepts. The existing Qualcomm Stadium is owned by the public, and under current agreements taxpayers are responsible for 100% of the cost for repairing the aging facility. The financial concept announced today for a January election fixes this by putting a strict cap on the public contribution. I makes the Chargers responsible for operating and maintaining the new stadium and ensuring taxpayers are not on the hook for cost overruns. As for stadium financing overall, there’s a simple rule introduced that will see $2 spent in private money for every $1 in public funds.